Citation: Doran, Christine, et al. MITRE 1997 Mandarin Broadcast News Speech Translations (HUB-4NE) LDC2007T19. Web Download. Philadelphia: Linguistic Data Consortium, 2007. MITRE 1997 Mandarin Broadcast News Transcripts Translations (HUB-4NE) was developed by The MITRE Corporation and contains segment-aligned English translations of the 1997 DARPA HUB4-NE Mandarin transcripts. The original transcripts and the corresponding broadcast news audio are available as separate LDC publications, 1997 Mandarin Broadcast News Transcripts (HUB4-NE) (LDC98T24) and 1997 Mandarin Broadcast News Speech (HUB4-NE) (LDC98S73). The source data is comprised of 30 hours of recorded Mandarin broadcasts collected by the LDC in 1997 from Voice of America, China Central TV and KAZN-AM, a commercial radio station based in Los Angeles, CA. The original transcript segmentation is suitable for speech recognition, but does not support machine translation and machine translation evaluation. 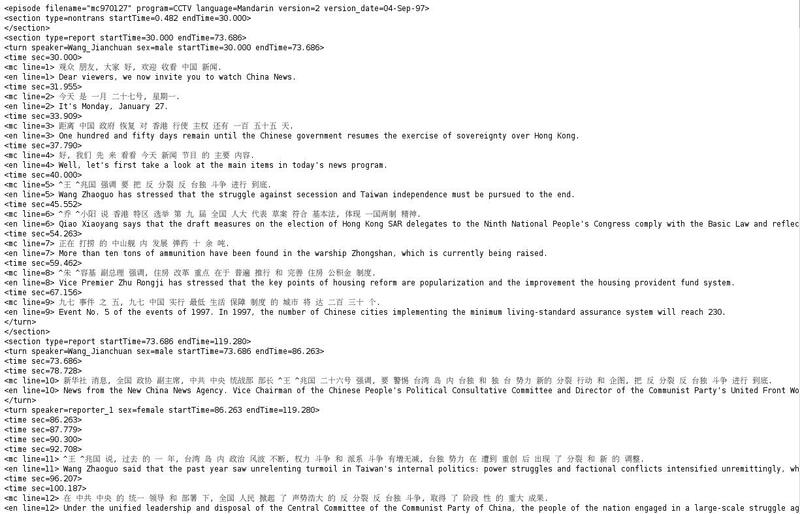 Therefore, the Mandarin side of these aligned transcripts was resegmented for this release. In all other respects, the Mandarin transcripts in this publication are identical to the original transcripts. The dataset in this release consists of 376K words of English text and 517K characters of Mandarin text. The English text was produced by translators with no access to the original audio. The translators were given specific guidelines for translation, and those are included in this distribution. A portion of the source data (6%) was translated four times in order to support experiments in translation evaluation. For an example of the data in this corpus, please examine this image of the text.